Now in Large Print! 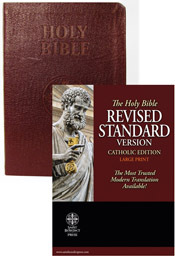 Popular Revised Standard Version, widely used with three year cycle of readings. Genuine Leather Burgundy Cover. With Gold stamped and embossed emblems, gilt edges, ribbon marker, full color maps and presentation pages.